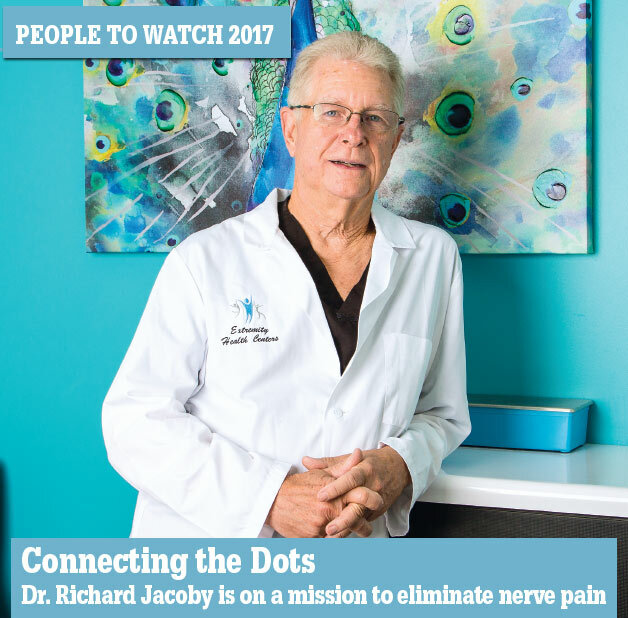 Dr. Richard Jacoby is passionate about treating patients experiencing neuropathy in their extremities, especially in diabetic patients. With 40 years as a doctor, his interest in nerve pain was inspired by his work with Dr. Lee Dellon in 2001. That ensuing passion is the reason he opened his comprehensive treatment center for foot and ankle conditions. Jacoby offers the complete range of available treatments for foot and ankle conditions in his facility, ranging from surgical to laser to wound care to neuropathy treatment and more. He offers the Dellon procedure for peripheral neuropathy, a treatment developed to counter the medical industry’s belief that neuropathy can only be masked and not cured. It involves freeing up pressure areas in the extremities, similar to a carpal tunnel procedure. Jacoby has had a perfect success rate in using the Dellon procedure. “I’ve treated over 10,000 patients using stem cells, laser or Dellon, and I’ve had no amputations,” Jacoby says. That kind of track record is what has earned Jacoby four peer nominations as Top Doctor in Phoenix. Jacoby is a former president of the Arizona Podiatry Association, and for the Association of Extremity Nerve Surgeons. Jacoby’s passion for his field isn’t just about treating these conditions, he’s equally passionate about educating his patients in the hopes of prevention. In 2015, he released his first book, “Sugar Crush,” which details a diet filled with sugar, processed carbohydrates and wheat causes damage to the peripheral nerves of the body and how eliminating sugar can reverse the damage. This book was the result of Jacoby connecting the dots over the years in both in his own clinical work and that of Dellon and Dr. John Cooke. “Nerves on Fire,” which will continue his explanation of how sugar inflames the nerves. For his practice, a new offering in 2017 is Calmare, a new scrambling procedure for the management of peripheral pain. It’s a non-invasive, drug-free treatment in which electrodes are placed on the skin and a “no pain” message is sent to the brain. Calmare is especially effective in pain management of chemo neuropathy in cancer patients.